Last week Jackie Bradley Jr., the starting centerfielder for the Boston Red Sox, saw his hit-streak end at 29 games. For those of you who do not follow baseball, that means he hit the ball and reached first base safely without causing an out for 29 games in a row. Quite a feat. Anyway, because it is a feat, the story gets covered and in this case, by the Boston Globe. 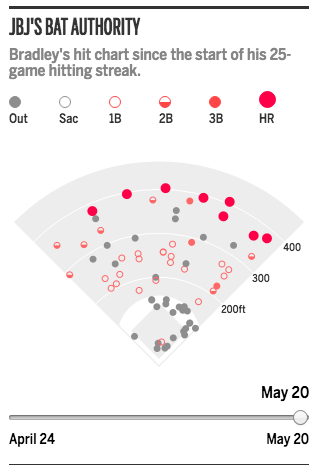 They wrote several articles on Bradley and the hit streak, but this one included a small, interactive graphic that mapped out his hits. 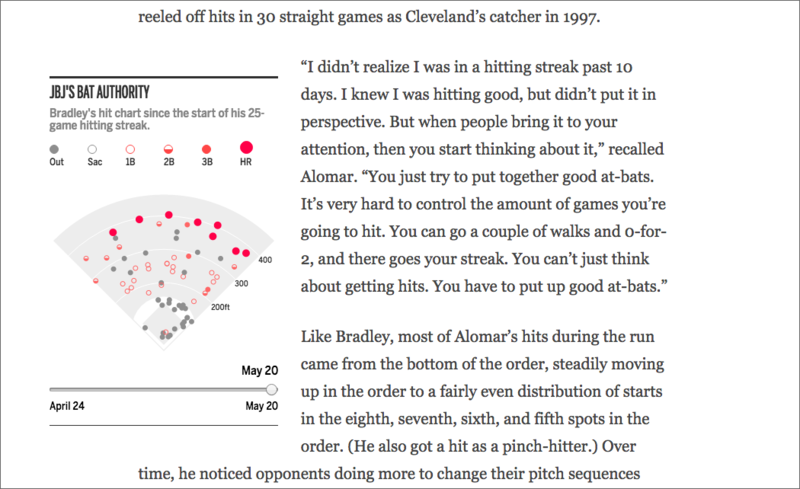 Because a streak exists over time, the component includes a slider to show how the hits have progressed. Overall, a very nice piece. 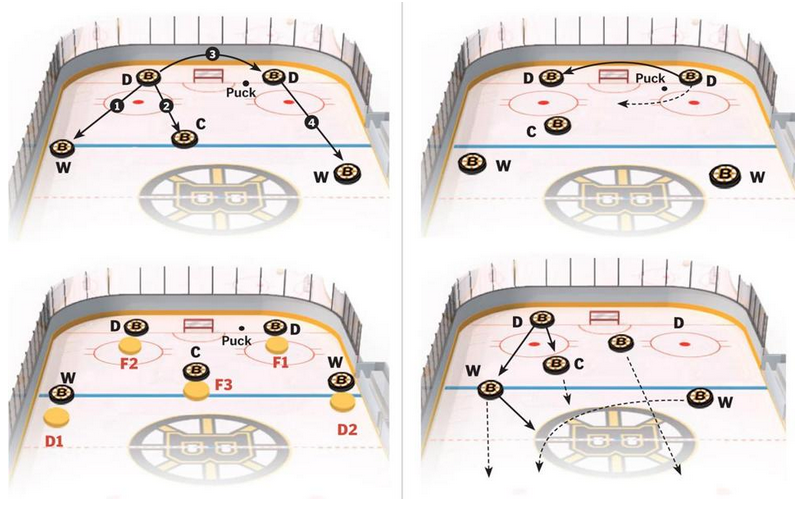 Credit for the piece goes to the Boston Globe graphics department. 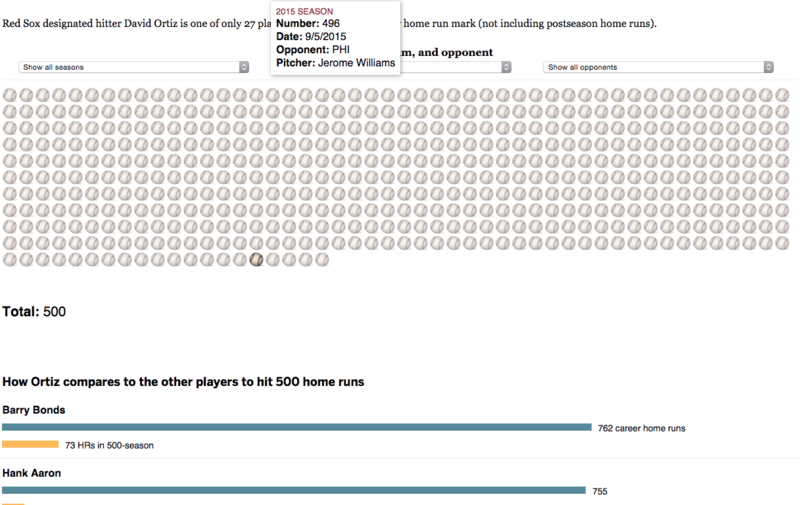 So what I was saying yesterday about there not being a new Boston Globe piece about David Ortiz’s 500 home runs. I was wrong. I missed it. 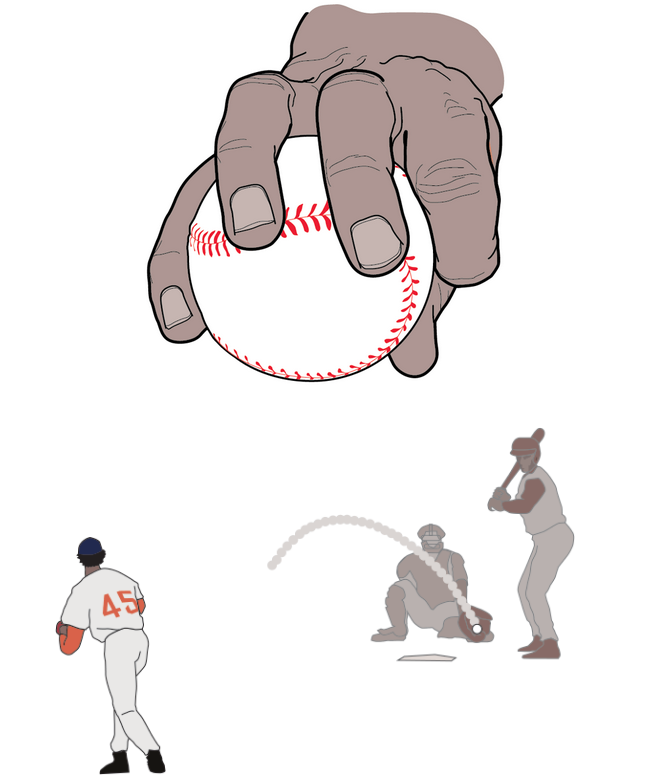 But, here you go, in its semi-splendour (not digging the illustration of the baseballs /quibble). There are some merits to the piece in terms of the filtering—you can by season, opponent, or the teams for which Ortiz played (only 58 for the Twins)—but let us not lose fact of the fact that this is all about No. 500. I have seen a few in my years, including that one. Credit for the piece goes to Patrick Garvin. This past weekend, David Ortiz hit his 500th home run, a significant milestone in Major League Baseball attained only by a handful of players. 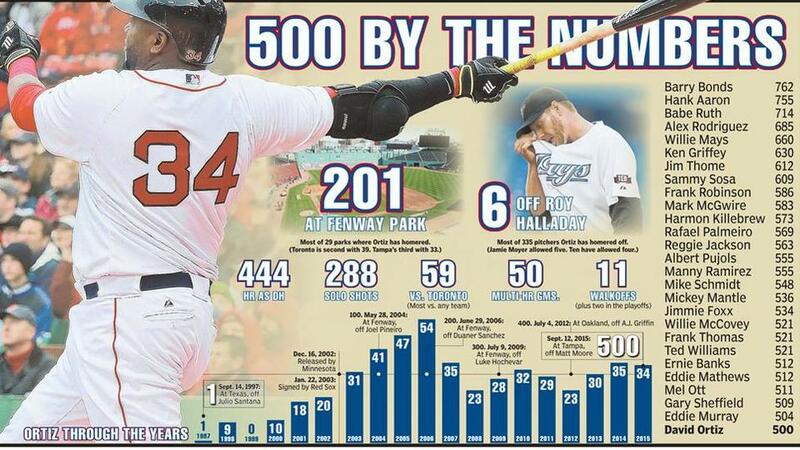 This piece from the Boston Herald commemorates the feat—with too many photographs and embellishment for my liking—by putting his season totals on a timeline while putting Ortiz at the bottom of the 500+ home run club. The following piece dates from April 2015 and was about the impact of defensive shifting on Ortiz, but it has a nice graphic on his home run output. It’s just outdated by most of this season. But, from a data viusalisation standpoint, I find it a far more useful and telling graphic. Credit for the Boston Herald piece goes to Jon Couture. 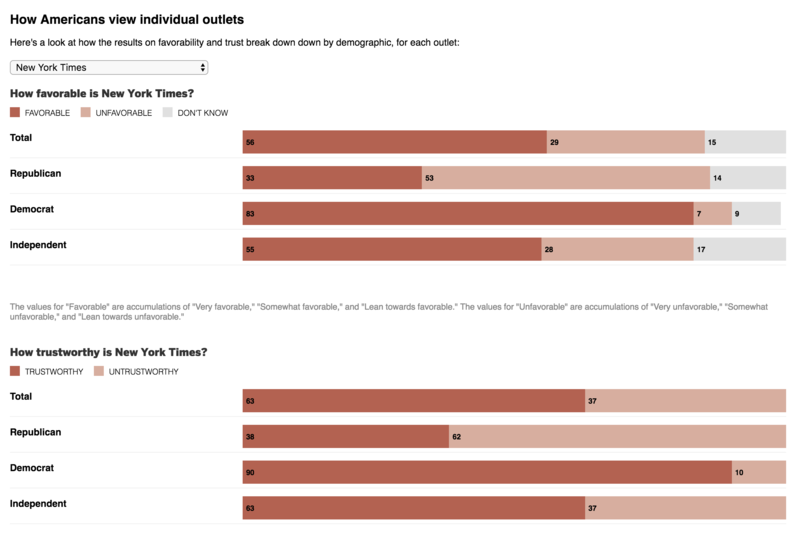 Credit for the Boston Globe piece goes to the Boston Globe graphics department. So the Red Sox in 2015 are godawful, terrible, bloody bad baseball. But, go back 11 years and they were amazing, fantastic, great and awesome baseball. 2004 was, of course, the year the curse was broken and that was in no small part due to the pitching efforts of Pedro Martinez, who would head down to Flushing in the off-season to end a seven year run of Pedro pitching for Boston. Well, this weekend, after being elected in his first year of eligibility, Pedro enters the Hall of Fame and then will have his number retired at Fenway. The Boston Globe looked at Pedro, his arsenal, his career, and his best game ever: the 1999 17-strikeout, one-hit performance against the Yankees in Yankee Stadium. 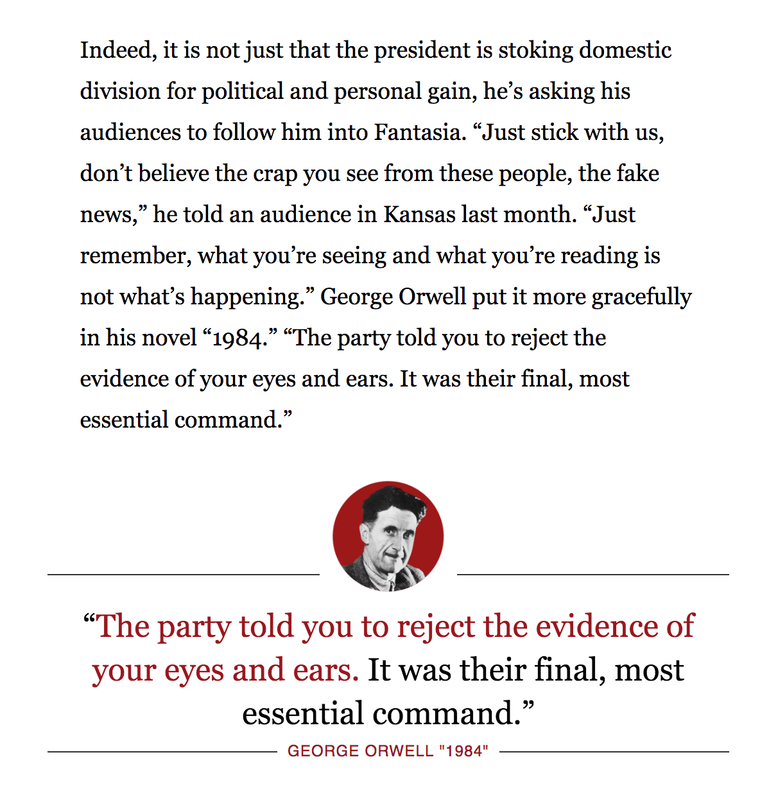 The whole piece is worth a looking. But this screenshot shows just how devastating his changeup was, especially in the context of an upper-90s fastball. I’m off to Kansas City this evening for Memorial Day Weekend. There, I fully intend to at least try some legitimate Kansas City barbecue. But how does this relate to a blog on information design and data visualisation? 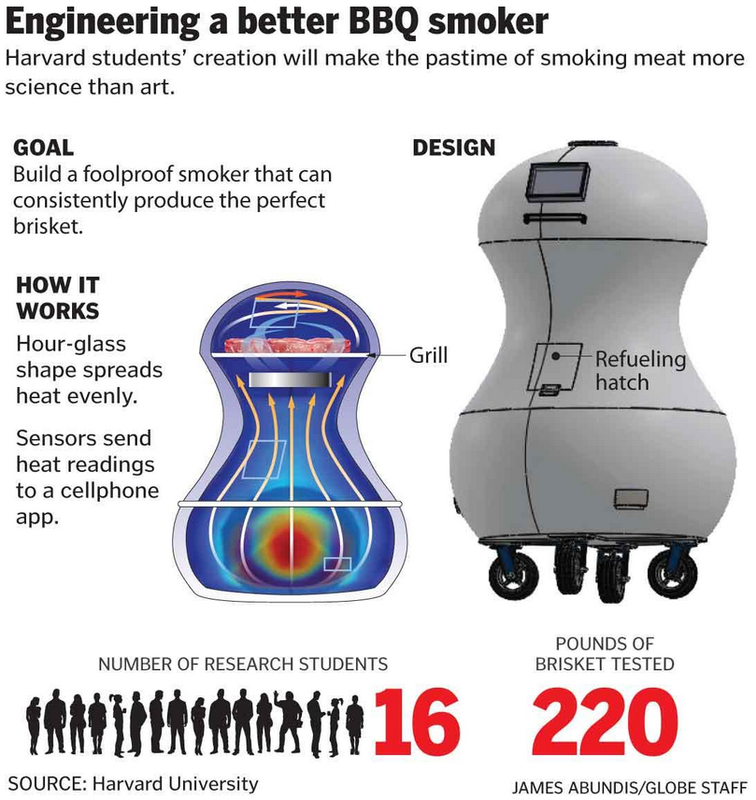 Well, some folks at Harvard endeavoured to design a better smoker for barbecue. Thanks, science. Credit for the piece goes to James Abundis. Science is great. But science is also a process and scientific progress goes boink. Some of the mis-steps in chemistry have been erroneous elements. 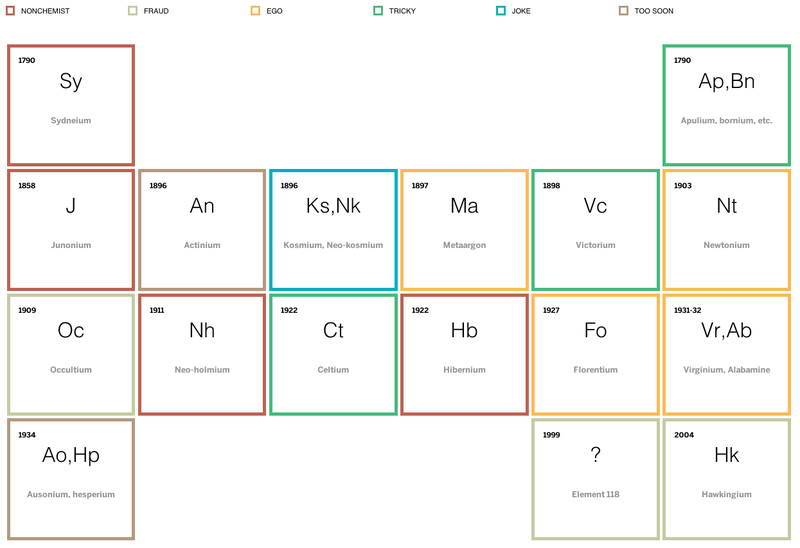 Thankfully the Boston Globe built a small periodic table of non-elements with short anecdotes about the selected few. Credit for the piece goes to Mary Virginia Orna and Marco Fontani. Your humble author has returned to Chicago from several days spent in Boston—among other places. So what better way to follow up on yesterday’s post about prostitution than a small piece from the Boston Globe about the increase in sexually transmitted infections (STIs) in Boston. The cause? Hook-up apps. Because, technology and young people. 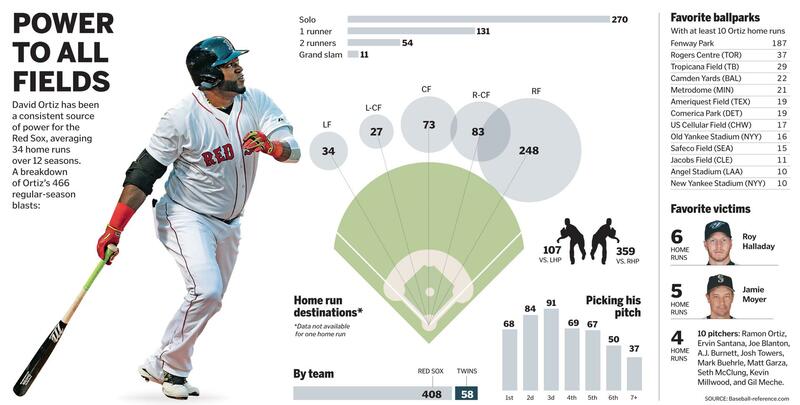 Credit for the piece goes to the Boston Globe’s graphics department. Two weekends ago I visited the Magritte exhibit currently showing here in Chicago. While I would love to share photographs of some of my favourite works, I cannot. The museum staff was clear that part of the rules for exhibiting loaned work was the prohibition of photography. 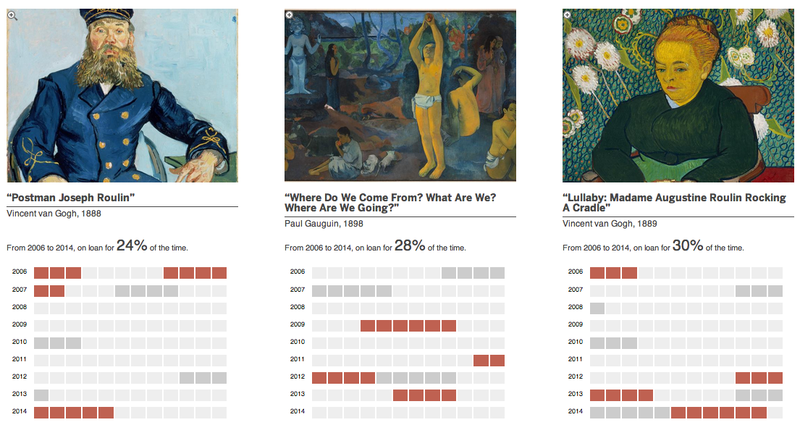 So that prompted me to wonder how often is artwork loaned? Thankfully, the Boston Globe (sort of) answered my question this past weekend with a graphic detailing some of the major loans from Boston’s Museum of Fine Arts. Credit for the piece goes to Cecilia Reyes.